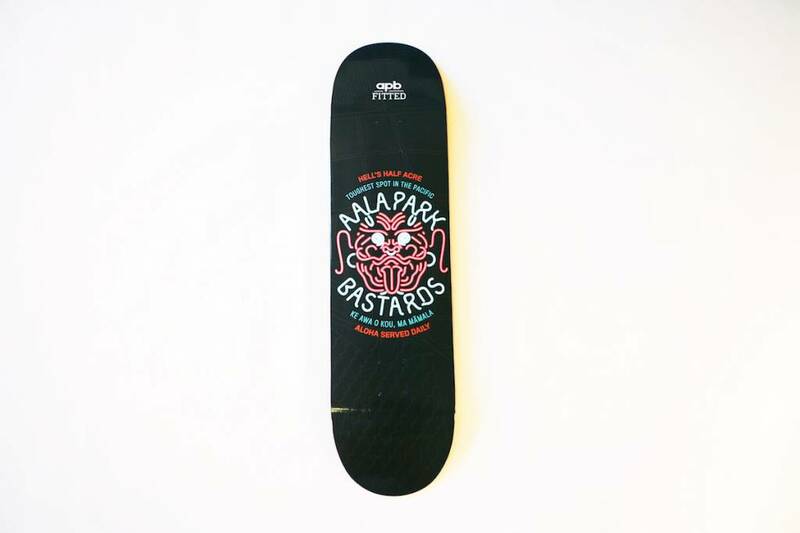 Bastards Deck - APB Skateshop LLC. HELL'S HALF ACRE - This little parcel of land in Chinatown became notorious for being an adult playground, filled with crime, hookers, drugs, scandal, and downright debauchery—and many wouldn’t have it any other way. It was almost its own self-governed society, with all the different businesses knowing their roles and playing their part. Ordered chaos, if you will. For the past 30 years skateboarders have reveled in that chaos. The A'ala Park Bastards span several generations of Chinatown skateboarding. Our brothers at Fitted brought us in to complete their collection. With our roots tied to A'ala and skateboarding in Chinatown, the Bastards are once again at play in this half acre of hell we call home. Hell's Half Acre Honolulu from DownwithAPB on Vimeo.